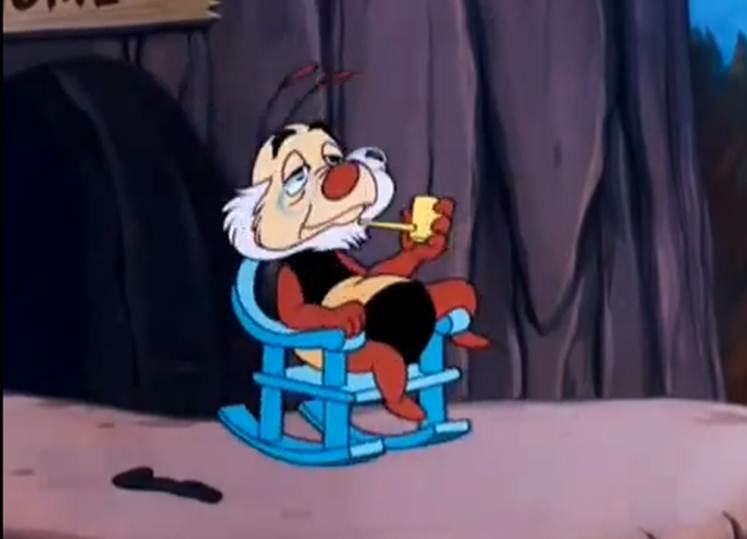 The relationship between Donald and Spike the bee has been one to watch in the latest versions of the Donald Duck shorts. As I’ve said here many times, the best Donald Duck shorts are ones where he gets progressively frustrated, leading to some sort of manic blow up. Certainly the original Spike & Donald shorts started off this way, but when we get to Let’s Stick Together, things have changed. In this one, the two become partners rather than adversaries, and it leads to some intriguing gags. The story of Let’s Stick Together is told by an aged Spike, looking down from his tree perch on a bearded Donald. The entire story is told in flashback, which gives it a more cohesive narrative than some of the other shorts we have looked at recently. The tale unfolds before the viewer, rather than making quick transitions from gag to gag. There is a higher degree of storytelling going on in this short than in others of the early 1950s, and it’s a welcome sight. Having Spike as the narrator, though, tends to make things much more about him, as the story is told from his point of view. To that end, it’s not really a Donald Duck story, but more about the bee’s interactions with him. 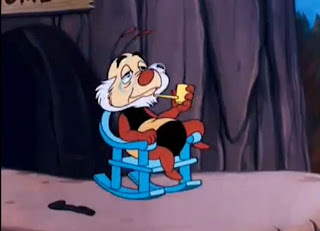 We hear how the bee was trying to find a new occupation, and ended up working with Donald as a trash collector, using his stinger to give Donald a break. 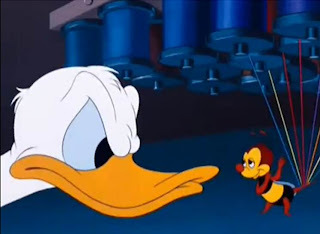 It’s a cute gag that ends up as the foundation for the story, as Donald finds new and intriguing ways to use Spike’s stinger to create new businesses. My favorite is when Donald has his little friend tattoo sailors who have come in for Fleet Week. Through all kinds of ventures, such as Spike popping the balloons that Donald just sold to kids or creating a factory that has Spike sewing things together with his stinger, Donald is looking for the next big buck. Spike, though, has different plans when he meets a female bee in the greenhouse after a particularly long day. Once he falls in love, there’s no turning back. Hearts and love messages end up on every single piece that Spike is sewing, causing Donald to go crazy. He takes it too far, trying to crush the female with a fly swatter, causing the break-up of the duo. In the end Donald goes a little nuts, but not in the way that he has in other shorts. It’s a simple touch, but inverting the formula of having his antagonist drive him crazy and making them partners made the whole thing feel fresh. They even end up re-uniting at the end, because Spike has had enough of his badgering wife. 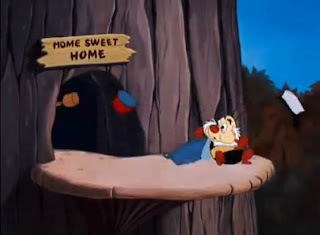 It’s so interesting because it makes for something unique, which was not the hallmark of Disney shorts of the time.